Violence against foreigners in South Africa spread to Cape Town overnight with people assaulted and shops looted. The attacks broke out during a meeting called to prevent anti-foreigner violence in the Dunoon township. 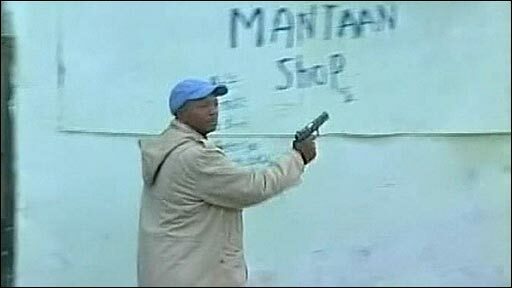 The BBC's Mohammed Allie in Cape Town says Somali shops were looted and one Somali killed and six others injured. He says there have been shack-to-shack searches for foreigners and some local residents have begun flying the South African flag outside their homes. Meanwhile, the governing African National Congress (ANC) party has urged its supporters to help police take back control by forming street committees. More than 40 people have died and some 15,000 people have sought shelter since the violence initially flared up in the Johannesburg township of Alexandra almost two weeks ago. There are fears that the unrest could have longer term consequences for the country. Moeketski Mosola, head of South Africa Tourism, told the BBC the government is alarmed by the situation, especially as they are preparing to host the football World Cup in 2010. "We are extremely concerned about the situation on the ground, you must remember that 67% of the tourists coming into South Africa are mainly African," he told the BBC's World Tonight programme. Cape Town is the hub of South Africa's tourism industry. There have also been new attacks in Strand, east of Cape Town, Durban and North-West province, where three people, reportedly from Pakistan, were stabbed and dozens of Mozambican and Somali nationals displaced. On Thursday, troops were deployed to quell attacks - the first time soldiers have been used to stamp out unrest in South Africa since the 1994 end of apartheid. Police said it took them eight hours to contain the unrest in Dunoon, 25km from the city centre, and several people were arrested. "Some people were assaulted, but mostly shops were looted," police spokesman Billy Jones told AFP news agency. John, a Malawian at the Dunoon meeting, said it disintegrated and foreigners started fleeing as groups began to loot Somali-owned shops. "We feared for our safety. They're just killing everyone - they start beating you when they find out you're a foreigner," he told the BBC, adding that he was returning home as soon as possible. Thursday night's unrest prompted some 500 people, including Somalis, Mozambicans and Nigerians, as well as Zimbabweans to flee their homes, some seeking refuge in police stations. Our correspondent says the police have beefed up their presence in other Cape Town trouble spots as looting spread on Friday. Cape Town first witnessed xenophobic attacks two years ago when the Somali community - especially those who owned shops - were targeted and some murdered. Durban also witnessed unrest earlier this week but most of the violence has been in the Gauteng region around Johannesburg, which is now reported to be relatively quiet. Meanwhile, the government and union leaders are to meet to address the crisis in South Africa's crucial mining industry. Medium-sized firm DRDGold said two of its workers - one of whom was South African - had died in violence near Johannesburg on Tuesday. 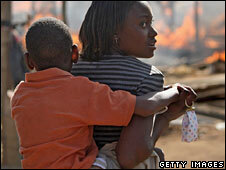 How can S Africa end the violence? It said more than half of the miners on Thursday's day shift had failed to report for work. Almost a third of the mine's semi-skilled workers are foreign. National Union of Mineworkers President Senzeni Zokwana appealed for calm. "This situation has to stop; it cannot continue happening; it doesn't help the local people to chase others away. It is just wrong," he told the BBC's Network Africa programme. Mozambique's president has urged his compatriots not to respond to the attacks. His government has also mobilised emergency services normally used for natural disasters to cope with the exodus of an estimated 10,000 Mozambicans from South Africa. 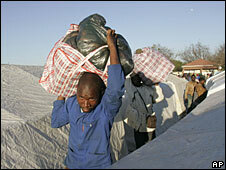 Some Zimbabweans are also going home, preferring to risk the violence there than stay in South Africa. One Zimbabwean woman told the BBC she had decided to return home from Johannesburg after seeing a gang douse a Mozambican immigrant with petrol and throw him into his burning shack. "The screams of the burning Mozambican still haunt me. When I close my eyes to try to sleep, I see the man screaming for help. But no-one helps him," she said. "I have never seen such barbarism."